Dr. True completed her medical training at the Southwest College of Naturopathic Medicine in Tempe, Arizona, where she graduated with High Honors earning the prestigious High Academic Achievement Award. Prior to receiving her Doctorate, Dr. True obtained her Bachelor of Science Degree focusing in Human Physiology and Chemistry from the University of Oregon. Dr. 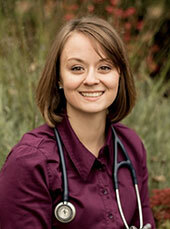 True completed her residency here in Portland, Oregon focusing in family practice and hydrotherapy. She is a member of the Naturopathic Medicine Institute, American Association of Naturopathic Physicians and the Oregon Association of Naturopathic Physicians. Dr. True is a family practice physician trained in nutrition, homeopathy, botanical and physical medicine as well as hydrotherapy. She has also had extensive training in Therapeutic and Intravenous Nutrition, Chinese Medicine, Women’s Health, and Diabetes Management. The current conventional medical model is one based on “disease-management”. Symptoms and disease are our body’s way of telling us there is an imbalance – which is often nutritional, hormonal, musculoskeletal or even emotional. Dr. True’s approach to patient care involves determining what imbalances are affecting health, and aiming treatment towards reversing these obstacles, helping to restore normal function of the body and its systems. This often helps our own bodies heal from within without the use of pharmaceuticals or surgery.